alaTest has collected and analyzed 55 reviews of Panasonic HDC-HS80. The average rating for this product is 4.2/5, compared to an average rating of 4.0/5 for other Camcorders for all reviews. People really like the zoom and price. The image quality and portability also get good views. The battery and size get less positive comments, while reviews are divided on the reliability. We analyzed user and expert ratings, product age and more factors. 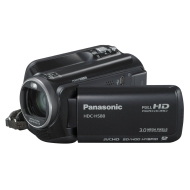 Compared to other Camcorders the Panasonic HDC-HS80 is awarded an overall alaScore™ of 84/100 = Very good quality. alaTest has collected and analyzed 15 user reviews of Panasonic HDC-HS80 from Amazon.co.uk. The average user rating for this product is 4.1/5, compared to an average user rating of 4.0/5 for other Camcorders on Amazon.co.uk. People are impressed by the battery and zoom. The portability and size also get good feedback. There are some mixed comments about the price. The HS80 lacks the sleekness of its competitors and the video quality, while satisfactory, fails to break any new ground. I have a relatively big hand and its small size can be awkward. The strap has limited adjustment. Wind noise can be an issue, but probably no more than any other camera. Just an overall brilliant product. Love it all very good. only had the camcorder a short while so have not really used it but what I have done has been easy. picture quality is very good.